Once the fourth largest inland body of water in the world and half the size of England has over the last few decades almost totally disappeared. The Aral Sea sits in the middle of the Kyzylkum Desert fed by the two rivers, the Syr Darya and Amu Darya. It wasn’t really a sea but a huge lake that these huge rivers flowed into but as it was in a large depression, the water could never flow out to the real sea and instead kept a steady level due to the evaporation from the sun. After WW2, the Soviet Union came up with the idea of becoming self-sufficient in almost every regard and different parts of the huge country were forced to specialise in certain industries no matter what people had worked as before. Soviet planners decided that Uzbekistan, Kazakhstan and Turkmenistan would be great agricultural areas and particularly good for cotton if only they weren’t so dry and arid. Never fear though for they decided to divert the rivers and they used the snowmelt waters from the distant Tien Shan mountains to irrigate the dry deserts. Cotton production soared but as the Aral Sea was no longer receiving much water, it began to become more shallow. As a result the sea became ever more salty and by 1977, the fishing industry had collapsed by 75% and by the next decade had disappeared entirely. As the sea shrank, the until now relatively benign climate considering its desert location became much harsher as the cool waters no longer moderated the climate. The weather became hotter and more extreme in the summer and much colder in the winter. Cotton production became nearly impossible. The Sea shrank further and the contaminated exposed salty seabed soils and salts were blown across the region, poisoning the nearby land. 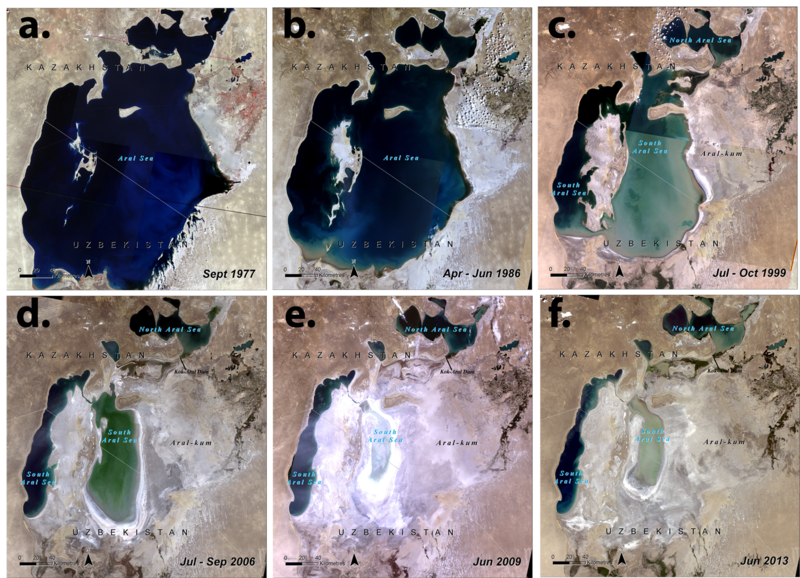 The disappearing Aral Sea – note that the first photo is after the sea started shrinking. The once great lake split in two in the 1990’s and by the year 2000 split into 4 but still the waters receded until there were barely any waters left. In a last-ditch effort to save some of the lake, Kazakhstan built a dam between the northern and southern parts of the Aral Sea. It was completed in 2005 and meant that all the water from the Syr Darya was now kept within the northern portion of the Aral Sea. However the dam was basically a death sentence for the southern Aral Sea, which was judged to be beyond saving and it has now almost vanished. Fishing communities now lie helpless, miles from any sea water whilst in the smaller north Aral Sea, the lake is re-establishing itself with the salinity of the water decreasing and fishing once again becoming viable. 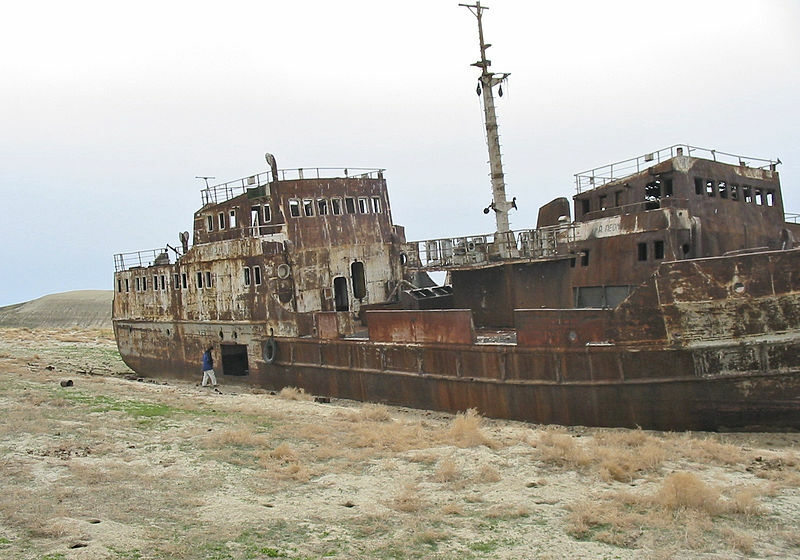 Abandoned ships at a former Aral Sea Port. The health of the local people has suffered with high rates of cancer and respiratory diseases no doubt caused by the polluted soils and airborne salty soils. 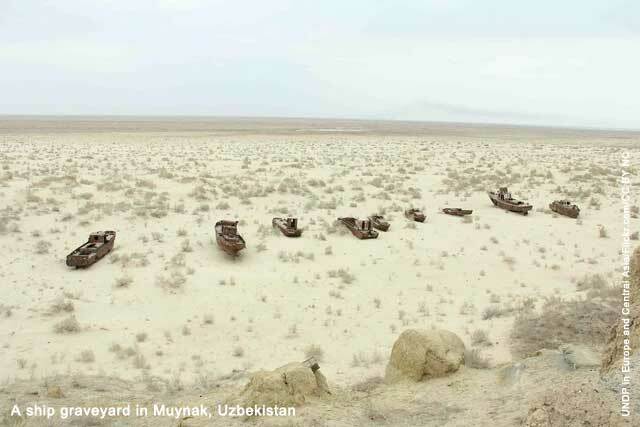 The government of Uzbekistan sees no need in doing anything to reverse or even mitigate the problems of the vast wastelands of the southern Aral Sea and as if pollution there isn’t bad enough is looking at drilling for oil there. At least in the Soviet era, the problem could be managed or rather ignored and hidden away by one central government. Now though the Aral Sea is a problem for multiple nations and only one of which shows any intent to solve the problem which has seen the sea reduce to around 10% of its former size. 60 miles from the coast lies this large rusting ship. Evidence shows that a certain level of recovery would be possible for example in Iraq, Saddam Hussein drained the marshes in a deliberate attempt to ruin the habitat and culture of the marsh Arabs. It was something he was largely successful in achieving but many years of hard-work have reversed the worst effects of his policy. However for the same to happen in the Aral Sea, the amount of water diverted from the primary inflows would have to reduce by 92% whilst the governments of central Asia have plans to use even more water. Kazakhstan has plans to build a new dam and enlarge the northern portion of the sea but it would still be a fraction of the original size. As such the fate of the Aral Sea looks to be a bleak one and makes for a useful warning of what can happen when people take too many liberties with the environment. Not only can the natural resources be ruined and wasted but mother nature can quickly take away any short-term advantages and in fact create serious problems much worse than were present in the first place. 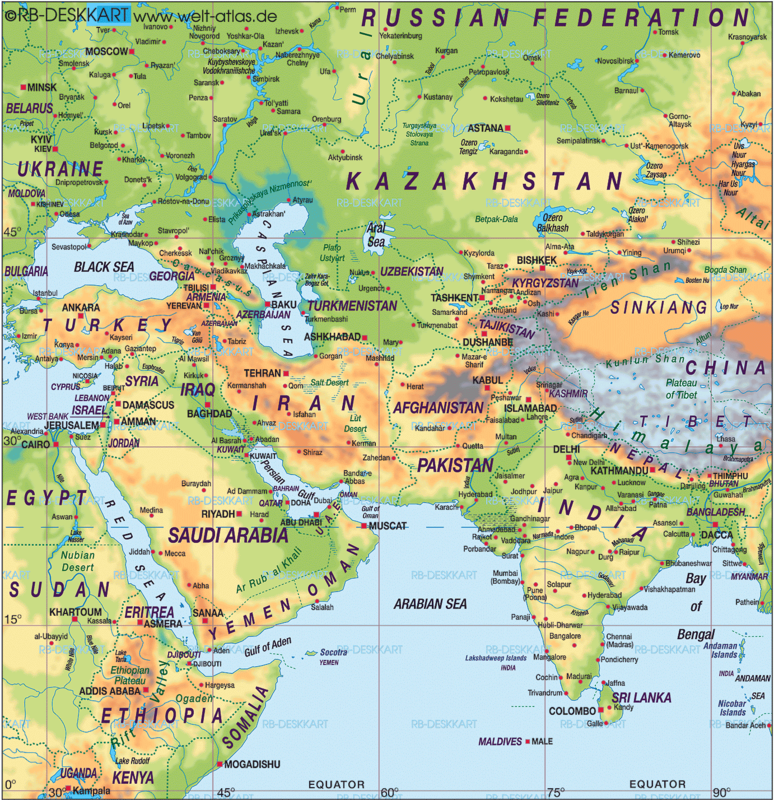 This entry was posted in geography, history, Life, Politics, Science and Engineering and tagged Aral Sea, climate change, Desert, Environment, geography, Green Issues, history, Kazakhstan, Life, Soviet Union, Uzbekistan. Bookmark the permalink. It is, especially as it was entirely avoidable. The main environmental problem is the fact of 7 billion people, all of whom aspire to the American standard of living. As a species, we’re committed to what we’re doing for better or worse. Solving global warming and so on would probably mean cutting off the living of a substantial part of the human population, so it won’t be done. Any benefit from energy efficiency improvements will be swamped by another doubling of humanity to 14 billion over 50 years. I think you’re entirely correct which is a huge problem for us all and a bigger problem still for those born in 50-100 years time. Thanks for commenting. Hi Stephen, what a great blog, so interesting. Thanks!